The ice cracks under my feet, and I realize that is probably one of the scariest sounds in the whole world. I’m on thin ice, really. I’m gingerly stepping along the edge of pond ice just off the Herbert Glacier trail. Big mistake. I can’t tell what’s ice and what’s firm ground until I step on it. It’s November, just after the first big freeze and snowfall of the year in Juneau. I’m midway up the Herbert Glacier trail, an undeveloped area on the edge of the backcountry about 30 miles north of town. I’m checking out reports of a pond that looks like it was just visited by French environmental artist Christo. Or maybe someone dumped a case of Pepto Bismol. What caused the weird pink color? Local scientists suggest several possibilities for the pink or lavender color, but they say the only way to know for sure is to examine the water under a microscope. Jackie Timothy, Southeast supervisor of the Alaska Department of Fish and Game’s Habitat Division, told me her colleagues were curious, too. But they weren’t able to get out and collect any water samples. That’s why I was literally risking my life – for science! Carrying empty plastic bottles and armed with some ice-cracking tools, I head about 3 miles up the trail to find three ponds buried underneath several inches of ice and snow. But the water I collected was not pink. Later, I learned that I was at the wrong set of ponds. “Ohhh!” I said, realizing that I had made a huge blunder. I should’ve hiked another mile down the trail. Not only did I fail to go far enough down the trail, I also fumbled my role as a citizen scientist. Jackie Timothy of ADF&G reminded me that my sampling bottles should’ve been sterile. 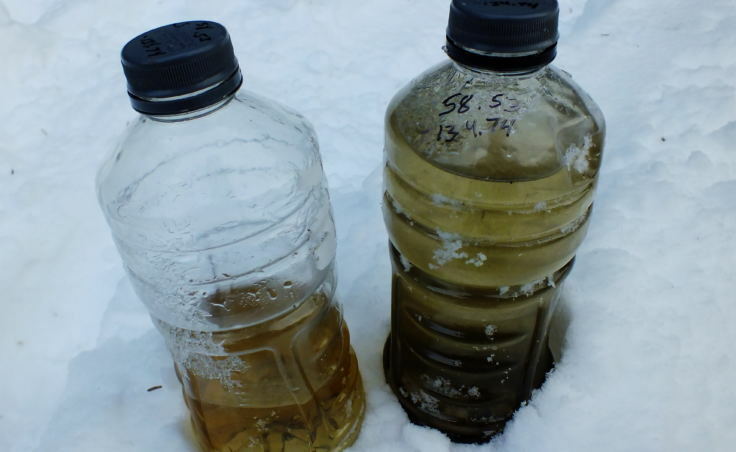 Still, I take my light yellow, mostly clear water samples to the U.S. Forest Service’s Pacific Northwest Research Station in Juneau. Stream ecologist Rick Edwards and entomologist Elizabeth Graham use a microscope to look. “Just looks like normal algal flock with organic matter. I don’t even see any –” Edwards said. “Ooop! There’s someone moving through,” Graham exclaimed. All they see is some pond debris, a couple of little bugs commonly known as water boatmen, and a very energetic form of plankton called a copepod. So, what could’ve caused the pink color shown in the pictures? 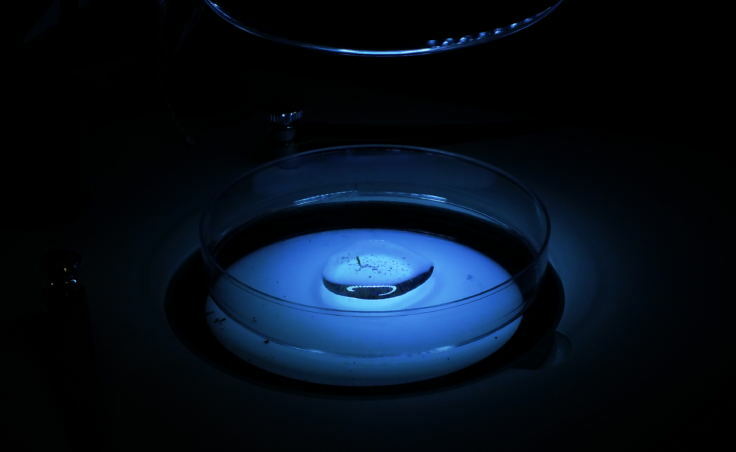 Possibilities include sulfur bacteria, blooms of algae called dinoflagellates, or salt-loving microalgae like what was found in western Australia’s Lake Hillier. Edwards refers to Hutten’s wispy description as a possible indication of a fungus. Edwards said a fluorescent marker dye used by hydrologists to track water flow in such a remote area is very, very unlikely. I was probably just too late. 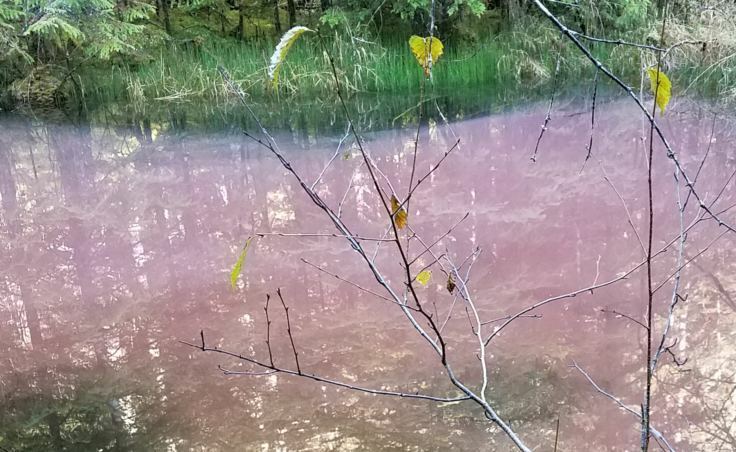 In addition to making it difficult to find the ponds, Edwards says the snowfall and freezing temperatures likely altered or ended any process that generated the pink color. So, the mystery of the pink pond will remain a mystery, at least for another, warmer day. The GAIA GPS app generated this map, which shows where Matt Miller sampled water along the Herbert Glacier trail. 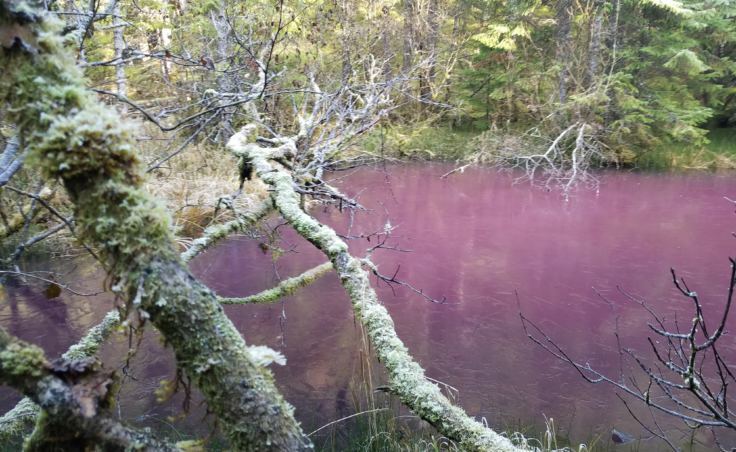 The actual location of the pink pond was likely about a mile further east.